In “Institutional Innovation and Podular Design“ I noted a number of insights from the Aspen Institute’s report, Institutional Innovation: Oxymoron or Imperative?, especially that “the most important innovation challenges are now in fact institutional in nature.” As an aside, let me just note that institutions typically change in dramatic ways only over long periods of time. Think of institutions such as religion, government, the economy, and then consider the various organizational forms in which these institutions took shape across cultures over time. To start, let’s consider many companies organize teams and then turn to the “power of collective intelligence” mentioned by Adler to see how the two relate to podular organization. Several research projects in recent years noted the fuzzy boundaries of teams in large organizations. Skilful Minds first noted this phenomena in Who’s on Your Team? Enterprise 2.0 and Team Boundaries , and then a couple of years later in Social Learning, Collaboration, and Team Identity. First, organizations increasingly require collaborations to be fluid in their organization and composition, able to adapt to the rapid changes of the external environment. Second, collaborations increasingly overlap with one another, sharing resources — including people — as those resources become more limited due to increased competition. Third, collaborations must increasingly take into consideration the different contexts within which collaborators are embedded, including locations, time zones, cultures, and languages, structures, or organizations. The liminality of such transitory teams results from several institutional challenges including the high degree of misunderstandings that initially occur due to team members rarely having the time to translate the different ways of thinking that people bring from their professional specializations into a mutual understanding of their shared business purpose. Developing mutual understanding requires shared experiences, getting to know who you are collaborating with, not just what they do or their skills profile. In addition, conflicting functional priorities, and often a lack of clear accountability, make it difficult for such teams to remain focused on the business purpose of their collaboration. Teams were not always organized this way. As Mortensen notes, teams in multi-divisional companies were, at one time, defined by bounded and stable team membership and common goals that interdependent work was required to meet. 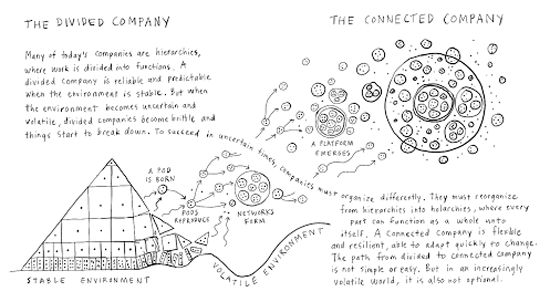 Cross-functional teams in such companies today are not typically defined by bounded and stable membership, and common goals are still too often related to divisional performance driven by scalable efficiency rather than a connection to the purpose of the business the team is serving. Over the last 40 years, the emergence of new digital infrastructures and a global liberalization of economic policy have increased the pace of change exponentially. Many companies that were extremely successful in earlier times of relative stability are now finding that their relationship architectures are fundamentally misaligned with the needs of their business today. As the pace of change increases, many executives focus on product and service innovations to stay afloat. However, there is a deeper and more fundamental opportunity for institutional innovation—redefining the rationale for institutions and developing new relationship architectures within and across institutions to break existing performance trade-offs and expand the realm of what is possible. Institutional innovation requires embracing a new rationale of “scalable learning” with the goal of creating smarter institutions that can thrive in a world of exponential change. We’ve recently seen a more robust cross-functional construct emerge, one with an overarching organizational structure, based on building and maintaining a distinctive capability. Members of these capabilities teams are assigned permanently to them, reporting there rather than through a functional hierarchy.